The design process was very much a collaborative one, with Blohm+Voss and ZHA working together to address the practical challenges of designing a yacht while remaining true to the design language of the master prototype. 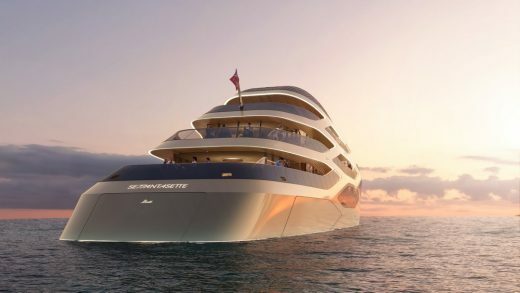 The resulting designs are the synergy of Hadid’s design vision and the technical expertise of Blohm+Voss, allowing a flexibility and customisation in the eventual design of the yacht. Blohm+Voss has the proven experience, the in-house technical expertise, and the capacities to offer tailor-made solutions for the most demanding buyers in the superyacht market. The naval architects of Blohm+Voss are forever pushing the boundaries of technology and innovation. In recent years Blohm+Voss has built many of the world’s most prestigious mega yachts. These include the groundbreaking 394-foot “A “designed by Philippe Starck , the “Eclipse”, designed by Terrence Disdale, which at 533 feet (162.5 m) is the world’s second largest private yacht. Other Blohm + Voss superyacht projects include, the “Mayan Queen IV” and the “Palladium”. Zaha Hadid Architects and Blohm+Voss have transformed yacht design; creating an innovative concept and developing this vision into a fully seaworthy prototype that offers dynamic new possibilities for naval architecture.